The Beagle 2 project is the British led effort to land on Mars as part of the European Space Agency’s Mars Express Mission, launched in June 2003. Scientists at the Open University have been major contributors to the study of a small group of meteorites which come from Mars and played a major role in deciding that conditions on the planet might be appropriate for life. These investigations provided the backdrop to the announcement in August 1996 by NASA scientists that they had found evidence for traces of fossilised bacteria in 84001 which precipitated an unprecedented scientific, public and media interest in Mars. With Mars the subject of considerable attention, an Exobiology Study Group, under the chairmanship of Professor Andre Brack (CNRS, Orleans), convened by Dr. Paul Clancy (ESA Manned Spaceflight and Microgravity Directorate), surveyed current research in exobiology and made recommendations to ESA on the nature of a future search for life elsewhere in the Solar System which pointed to the importance of Mars and culminated in a report The Search for Life in the Solar System. The group recommended that a lander capable of addressing exobiology questions should be sent when ESA had an opportunity to include in their space exploration programme a mission heading for the red planet. When in 1997 ESA announced a mission called Mars Express to be launched in 2003, the possibility of a lander dedicated to looking for life and conducting geochemical/atmospheric analyses was put forward by The Open University’s Professor Colin Pillinger, a member of the ESA Exobiology Study Group. Within a few days the name of the lander became Beagle 2 to celebrate Charles Darwin’s epic voyage which led to the writing of On the Origin of Species. Design of the landing spacecraft led by a British Consortium of Universities, research support teams and Industry, ranging from major space and engineering companies to SMEs, has progressed on an amazingly rapid timescale – reflecting the enormous interest of all concerned and their conviction of the worth of the project. Whilst HMS Beagle set forth for Tiera del Fuego, a place described as “desolate, depressing, sterile and repulsive”, Beagle 2 is destined for Mars and the search for the chemical evidence of life (past or present) on another planet. Mars is even more inhospitable and the search will have to extend below its surface layer. When Beagle 2 was first conceived in 1997 it was to be a lander weighing about 108 kg and to be part of a network providing geophysical survey data. That plan was shelved when the mass available on Mars Express was revised to only 60 kg. And so it was a case of deja vu. The original HMS Beagle was so cramped that to accommodate Darwin, the Padre was told he couldn’t go. Darwin, a very tall man, had to remove a drawer at the bottom of his bed to make room for his feet because his bunk was too short. The Beagle 2 team were equally ingenious and during the period April to October 1998 convinced ESA’s scientific and technical review committees that it could operate within the reduced mass budget. The lander’s design and experiment package was recognised as excellent by ESA’s Science Programme Committee on 3rd November 1998. Final approval came a year later on 10th November 1999. In the autumn of 2000 a review committee mainly of experienced engineers from NASA pronounced Beagle 2 ’eminently doable’ and a financial mechanism which would ensure delivery to the Mars Express launch tower was confirmed. In 1831 Charles Darwin joined HMS Beagle as the ship’s naturalist but not before he had overcome his father’s many objections why he should not go – not least that “it’s a wild scheme – no good would come of it”! 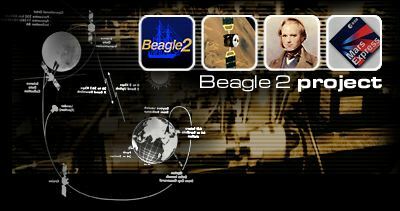 The outcome of Darwin’s voyage on the Beagle was On the Origin of Species which revolutionised our idea of life. It’s not remembered by many that Darwin contributed not only to the knowledge of evolution but collected many important geological specimens – moreover Beagle’s Captain Robert Fitzroy was an expert meteorologist – he eventually founded what was to become the modern day Meteorological Office. The lander destined for Mars as part of ESA’s Mars Express Mission will carry the instruments necessary to search for the signatures of life; it’s name Beagle 2 commemorates Darwin’s ship and the voyage which he called “the most important event in my life”. In the 1970’s NASA thought it had answered the question ‘Is there life on Mars?’. The majority of the experiments on the Viking spacecraft indicated no biological activity; the one apparently positive result was interpreted as a chemical reaction. Whilst the space exploration of Mars was stopped in its tracks, laboratory studies of the planet on Earth received an unexpected boost when it was found we already had rocks from Mars! In martian meteorites, carbonates have been found accompanied by organic matter; all living things leave evidence of their existence in the form of organic compounds or chemical fossils, even though no tangible fossil form can be seen. The organic matter in the meteorites, like the fossils, is controversial, there is no proof that it got there before the sample reached Earth. However, the scenarios proposed for how it might have entered the rock on our planet are equally implausible. The only way to reconcile the problem is to go to Mars and seek in situ evidence of organic matter, associated with features and minerals related to flowing water. From the age of various of the meteorites we know that water was around certainly 1.3 billion years ago and maybe as recently as 600,000 years (pictures provided by NASA’s Global Surveyor show features attributable to recent water activity). In any investigation done on Mars, however, the signs of life must be sought in locations where the harsh oxidising environment has been prevented from destroying the evidence. Such a place will be within the interiors of rocks or in the soil shielded by large boulders. Mars Express is the first ‘flexible mission’ in the revised ESA long-term scientific programme. Beagle2 and Mars Express were launched aboard a Soyuz rocket with Fregat upper stage boosters from the Baikonur Cosmodrome in Kazakhstan at 18:45:28 BST on June 2nd 2003. The spacecraft will carry a remote observation payload with some heritage from European instruments lost on the ill-fated Russian Mars 96 mission, as well as a lander communications package to support Mars lander missions from 2003 to 2007. The spacecraft will arrive at Mars in late December 2003. As a result of the relative positions of Mars and Earth in 2003, a launch during this window offers the shortest journey, the minimum transit time, allowing the maximum payload with the reduced fuel requirements. Beagle 2 will be the next lander to conduct a full suite of life detection experiments on Mars. But what then? Once Beagle 2 is built it will be the smallest, most heavily instrumented soft landing spacecraft ever produced. As such it will be a possible precursor of a follow-up to Mars Express or for other missions for construction of a network of geophysical stations on Mars. After the loss of two Mars missions in 1999, NASA announced that its plans for returning samples from the red planet in conjunction with the French Space Agency, CNES, would have to be postponed for almost a decade. Instead of a programme of landers and orbiters every two years, landing and orbiting will alternate. In 2001 NASA will launch an orbiter called Odyssey. Two years later, a few days after Beagle 2 touches down on Mars it will be followed by the Athena rover which will trundle from rock to rock photographing and performing inorganic chemical and mineralogical analyses.